Breeders charge anywhere from $2000 to $3000 for German Pinscher Puppies based on color and gender. Black and Tan puppies command a higher price in most cases due to the demand for this genetically recessive color. Price is NOT an indicator of quality, health or temperament as all breeders regardless of their ethical standards will charge these prices. Buyers should fully investigate breeders with regards to health guarantees and certifications, visit the breeders home to evaluate the conditions their puppies were raised in and the temperament of parents as well as do their research on the inbreeding coefficients of any litter you are considering buying from. Understand that the USDA requires that breeders with more than four females to make all sales in person with buyers or be licensed with USDA. If even one puppy is sold “sight unseen” they are required to submit to USDA liscensure. This measure is to crack down on unscrupulopus breeders who sell on the internet and is designed to protect the puppy buyers. For more information visit AKC’s Government Relations FAQ. Ear cropping and shipping may be additional costs for the new owner. What about tail docking and dewclaws? Tails are typically banded at birth or within the first 24 hours so those buyers who want a natural tail need to get their reservations in and pay in full for the puppy prior to their birth. You will get the puppy chosen at birth to be kept natural and we will not be able to factor in temperament. Deposits are refunded in full if there is no puppy in your preferred color/gender. Tail banding is not traumatic or painful to the puppy. A tiny orthodontic rubber band is placed on the tail at the desired length. The blood flow is restricted to the end of the tail causing the tail to go numb, wither, dry up and fall off within 2-3 days of banding. Dewclaws are typically removed unless being exported to a country where dewclaw removal is prohibited. Complete an Application * Applications are only kept for 6 months. If you wish to be on the notify list for future litters please drop me an email or resubmit your application. 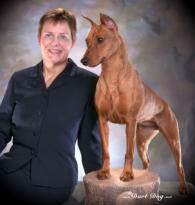 Gabi, #8 German Pinscher in 2018 and GCH Clefell’s Romeo #1 German Pinscher in 2012 are the proud parents of 7 puppies! Two red Males, 3 Black/Tan Males, 2 red females! more dedication on the part of new ownerss to get it right.